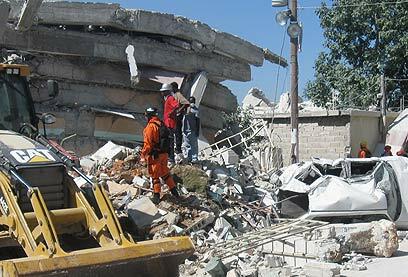 YNet News reports: "Religious rescue team holds Shabbat prayer with members of international missions in Port au-Prince"
ZAKA, a rescue team made up of religious volunteers, has been working overtime in the quake-stricken Haitian capital of Port au-Prince. Late Friday night they found a few minutes to conduct Kabalat Shabbat. "There was not really a Shabbat, but on Friday night we said Kiddush with delegations from Mexico, England, and Scotland," commander of the ZAKA mission to Haiti, Mati Goldstein, told Ynet. "With all the hell going on outside, even when things get bad Judaism says we must take a deep breath and go on to save more people." Goldstein added that his team had continued to work throughout Shabbat. "We did everything to save lives, despite Shabbat. People asked, 'Why are you here? There are no Jews here', but we are here because the Torah orders us to save lives… We are desecrating Shabbat with pride," he said. "One of the mission members wanted to raise morale, and we started to sing. The search team was working, the families were standing on the side, and everyone was singing 'Heveinu Shalom Alechem' (Trans: We bring peace to you). I had tears in my eyes." The ZAKA team is scheduled to remain for an additional two days in order to assist the US team, but they are adamant to make their Israeli identity clear. "The people here see it as very important that the State of Israel has come to help," Goldstein said. Between Friday night and Saturday dozens of truckloads of medical and logistical equipment were unloaded and the field hospital set up. The Israeli delegation landed in the capital of Port-Au-Prince yesterday evening and has located itself in a soccer field near the air port. Upon arrival C4I teams deployed communications infrastructure in preparations for the hospital's establishment. Two teams comprised of search and rescue personnel and canine operators from the IDF canine unit were sent out on rescue missions. The first team was sent to the Haiti UN headquarters in order to assist in rescuing survivors. The rescue teams are working in cooperation with local authorities in order to reach disaster struck areas where survivors can be located and assisted. I’ve been here since Thursday; no-one except the Israeli hospital has taken any of our patients. It’s like another world here compared to the other hospitals. They have imaging... my God, they have machines here, operating theatres, ventilators, monitoring, it’s just amazing. Of any American field hospital, there is apparently not yet any sign. The reporter observes that the Israelis have come from the other side of the world. Another aid worker says it makes them ashamed to be Americans. Israel sent a team of 220 aid workers. Israel has a population of six million. The population of Britain is 60 million. I’d say that was a disproportionate Israeli response, wouldn’t you?